Even though the new Little Sport line by Fancy Pants has images of football, baseball, basketball, and soccer, I managed to work it with wrestling pictures by using the stars, stripes, and chevrons patterns. The diecuts and stickers with the line help pages come together quickly! Start with a sheet of vanilla cardstock. Trim a 3-1/2” section of Fancy Pants – Little Sport – All Star Paper (star side) and adhere along bottom edge of layout. Add 3” section of Fancy Pants – Little Sport – Player Paper (stripe side) along top edge of star paper. Trim ½” strip of Fancy Pants – Little Sport – Flags Paper (blue solid side) and adhere along top edge of striped paper. Trim 4×6 photo (I cropped mine slightly) along left edge of layout, near center. Double mat second 4×6 photo with vanilla cardstock and Fancy Pants – Little Sport – Jersey Paper (solid blue side) and adhere photo slightly overlapping first photo as shown. To right of matted photo, add ½” strip of Fancy Pants – Little Sport – Go Team Paper (chevron side), “Go Team” banner and striped banner and “3” flag diecuts from Fancy Pants – Little Sport – Die Cut Banners. Add title on banner using alphas from Fancy Pants – Little Sport – Fundamentals Stickers. 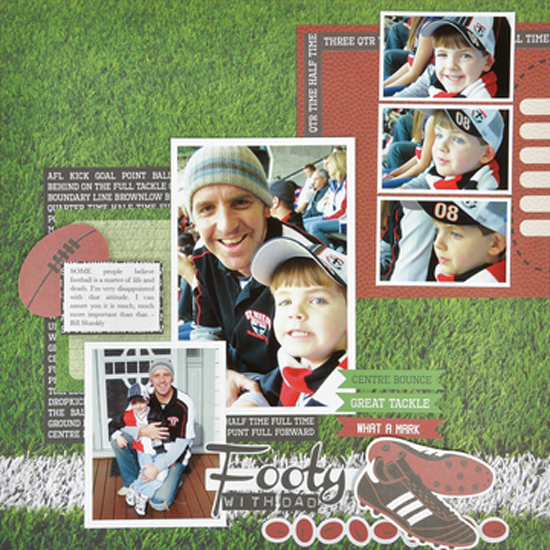 In upper right corner of layout, add flag/banner strips using diecut from Fancy Pants – Little Sport – Die Cut Banners and ¾” strips of (chevron) and Fancy Pants – Little Sport – Jersey Paper (stripe side) cut as shown. Add “3” diecut from Fancy Pants – Little Sport – Die Cut Pieces over center banner/flag. (I adhered with pop dots). Just above photo on far left, add stickers as shown from Fancy Pants – Little Sport – Fundamentals Stickers. Journal in upper left corner of layout.